The editors of Wiki Leak are one part magician and one part defense lawyer. Like a good defense lawyer they are careful never to lie outright; just convenient omissions coupled with spin which make innocent parties look guilty, and the guilty innocent. The sight of human beings, most of them unarmed, being gunned down from above is jarring enough. 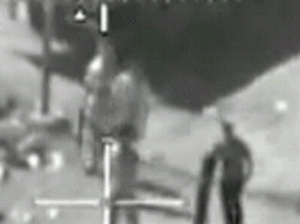 But for many people who watched the video of a 2007 assault by an Army Apache helicopter in Baghdad, released Monday by WikiLeaks.org, the most disturbing detail was the cockpit chatter. The soldiers joked, chuckled and jeered as they shot people in the street, including a Reuters photographer and a driver, believing them to be insurgents. “Look at those dead bastards,” one said. “Nice,” another responded. In recent days, many veterans have made the point that fighters cannot do their jobs without creating psychological distance from the enemy. One reason that the soldiers seemed as if they were playing a video game is that, in a morbid but necessary sense, they were. Between 3:13 and 3:30 it is quite clear to me, as both a former infantry sergeant and a photographer, that the two men central to the gun-camera’s frame are carrying photographic equipment. This much is noted by WikiLeaks, and misidentified by the crew of Crazyhorse 18. At 3:39, the men central to the frame are armed, the one on the far left with some AK variant, and the one in the center with an RPG. The RPG is crystal clear even in the downsized, very low-resolution, video between 3:40 and 3:45 when the man carrying it turns counter-clockwise and then back to the direction of the Apache. This all goes by without any mention whatsoever from WikiLeaks, and that is unacceptable. At 4:08 to 4:18 another misidentification is made by Crazyhorse 18, where what appears to clearly be a man with a telephoto lens (edit to add: one of the Canon EF 70-200mm offerings) on an SLR is identified as wielding an RPG. The actual case is not threatening at all, though the misidentified case presents a major perceived threat to the aircraft and any coalition forces in the direction of its orientation. This moment is when the decision to engage is made, in error. I have made the call to engage targets from the sky several times, and know (especially during the surge) that such calls are not taken lightly. Had I been personally involved with this mission, and had access to real-time footage, I would have recommended against granting permission. Any of the officers with whom I served are well aware that I would continue voicing that recommendation until ordered to do otherwise. A few of them threatened me with action under Article 15 of the Uniform Code of Military Justice for doing so. Better officers than they, fortunately, were always ready to go to bat for me and keep that from happening. That said, if either of the clearly visible weapons been oriented towards aircraft, vehicles, troops, or civilians I would have cleared Crazyhorse 18 hot in a heartbeat and defended my actions to the battle staff if needed. After reviewing the new information surrounding the incident, I now feel differently. My initial reaction (shared by most) was one of disgust. I had a strong emotional reaction to what I thought was an unnecessary slaughter. While I now know there were AK-47’s and RPG’s involved I still maintain: the van should never have been fired upon. When a threat is neutralized and there is an injured combatant with potentially useful information, he should be captured, not killed–but then again, I am not over there, I’m safe.